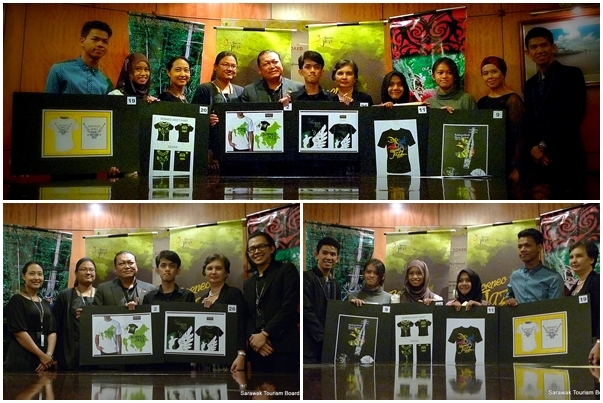 Bottom left: Team Lim Kok Wing University of Creative Technology with their lecturers and Dir of Corporate Comms - Sarawak Tourism Board (second right). Bottom right: Team UiTM with their lecturer. The prizes were in the form of festival tickets and certificates. Souvenir t-shirts based on the respective design, to be sold during the respective festivals, will be worn the world over. This is where the intangible recognition aspect of winning comes in. In attendance were the lecturers of the respective universities; Petrus Alfred and Keith of Lim Kok Wing University of Creative Technology; and Vincent Wong Thian Fook of University Technology Mara, Sarawak Campus.